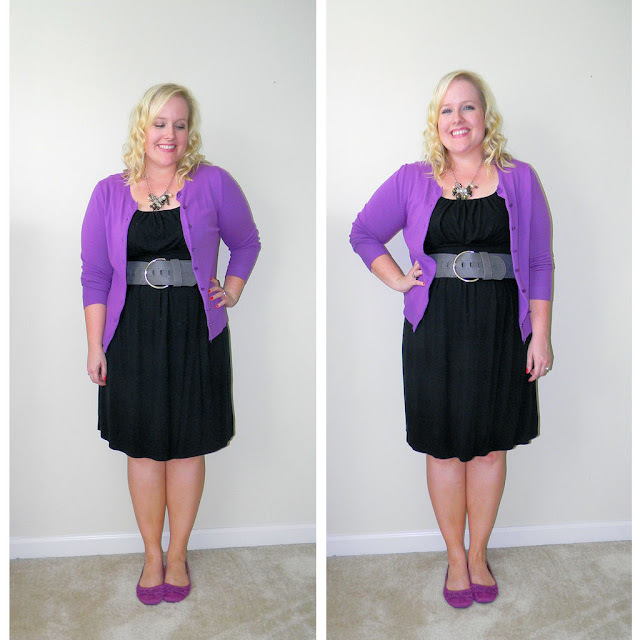 It's time for outfit 3 of the Little Black Dress challenge...where I try to come up with different ways to wear the same little black dress. Today's outfit incorporates a cardigan, ballet flats (like you're really surprised) and a wide belt. Check out the first challenge post here. See the second challenge post here. Do you like to remix your wardrobe staples? a dress, cardigan and ballet flats are basically my uniform. love it! Looks great...love the cardigans and how they can change a look!! Very cute. The 2nd one is still my fave. I'm curious, have you considered styling the LBD as a skirt? Like, with this look you could button the cardi up and wear the belt over it. I think that would give a different look with exactly the same pieces. Yes ma'am! I'm planning on doing that next! This is a great remix! I also think you should try to remix is as a skirt, one of my newest "tries" is doing that with some pieces in my closet! Gotta love a classic black dress. It really goes a long way. Love the way you have been remixing it. But pairing it with this bright cardigan and flats might just be my favorite rendition. Can't wait to see what you do next round! I wouldn't look very good in a black dress but your blog gives me ideas of what to buy my wife.